The Great Neck South High School Music Department has been involved in performing operas for the past forty-nine years. Our operas feature professional sets and costumes. We perform the score as written in the original language and provide English super-titles for our audience. To our knowledge, Great Neck South High School remains one of the only non-specialized public high schools in the nation with an active opera program. 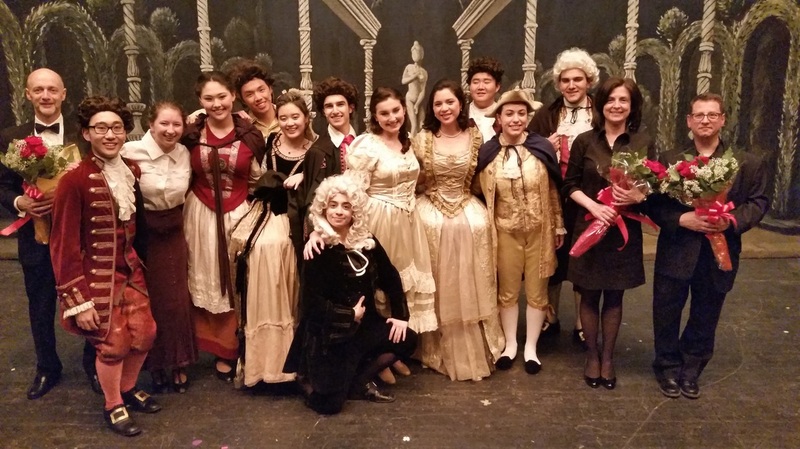 The opera is performed both on the stage and in the orchestra entirely by students attending Great Neck South High School. This year's graduating class of students leaves us having performed Suor Angelica/Gianni Schicchi, CARMEN, Le Nozze di Figaro and Die Zauberflöte. We feel that it is important for our students to be exposed to opera through reading, listening, and attending performances. And most importantly, we believe that students will gain the deepest appreciation of this art form by actually performing it. The opera is fully staged with sets, costumes and orchestra. If you have never seen a South High Opera, don't miss out next year! at 7:30pm in the Ruel E. Tucker auditorium at Great Neck South High School; 341 Lakeville Road, Great Neck, NY 11020. Exit 33. On the Northern State Parkway it is Exit 25. This production was performed in French with English supertitles provided. For information about future productions, contact Michael Schwartz or Dr. Janine Robinson at (516) 441-4851. This production was performed in Italian with English supertitles provided.